From coast to coast across the United States, Blue Grosbeaks are regular summer residents in dense streamside thickets. Most common in the south, they have spread northward in recent decades. 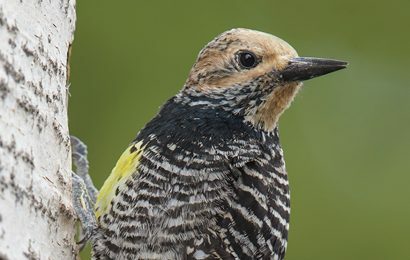 They now breed regularly north to New Jersey, Ohio, and North Dakota, and migrants stray as far north as Canada in both spring and fall, so birders everywhere have reason to think about identifying them. For many years, this grosbeak was classified in a genus by itself. It’s now placed among the Passerina buntings, along with Indigo, Lazuli, Painted, and Varied Buntings. 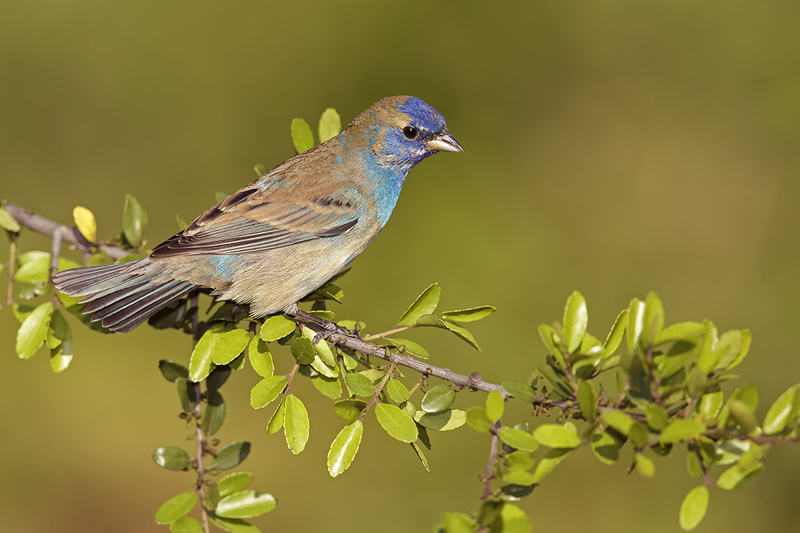 Although the Blue Grosbeak is distinctive after enough practice, it’s easy to confuse this species with Indigo Bunting, so this column will focus on comparing those two species. Adult males in breeding plumage are easiest to separate. Indigo Bunting males are blue only in spring and summer, molting into a mostly brown plumage for winter, while adult male Blue Grosbeaks are blue all year. The grosbeak has rich chestnut-rufous wing bars, the upper one very broad. Young male Indigo Buntings can be mostly blue with brown in the wings, including brown wing bars, but they never approach the grosbeak’s full pattern. In addition, male grosbeaks have black on the face around the base of the bill, lacking on the bunting. So the adult males in spring and summer can be recognized at a glance by markings alone. But to improve your ID skills, it’s important to do more than glance. 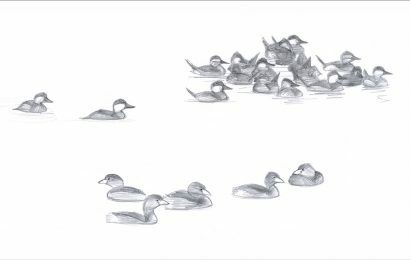 Take time to study these birds carefully and memorize their shapes, because aspects of shape are the best ways to identify the species in other plumages. Indigo Bunting might be described as being shaped like a “normal” bird, with no aspect standing out as unusual. Blue Grosbeak, however, is quite distinctive. Its bill is large and deep at the base; the pale base of the thick lower mandible makes its size more obvious. 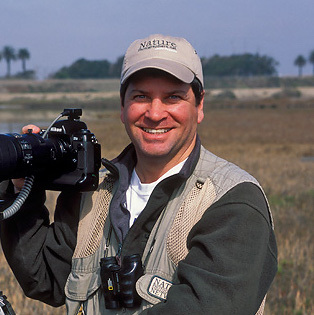 It has a large head (as large-billed birds generally do), and its body is stout. The overall stoutness of the grosbeak can make its tail seem relatively short, although this is partly an illusion. The tail is square or slightly rounded at the tip, not notched like that of the bunting, and often looks wide. This broad-tailed effect can be noticeable if you’re looking for it. For female-plumaged Blue Grosbeaks, wing pattern is the main field mark aside from shape. They always have contrasting wing bars, varying from buff to reddish brown, and the upper wing bar is usually broader and more colorful than the lower one. The back may have broad, blurry streaks, while the chest is unmarked brown. Female Indigo Buntings, by comparison, have plain brown backs and fine streaks on the chest. 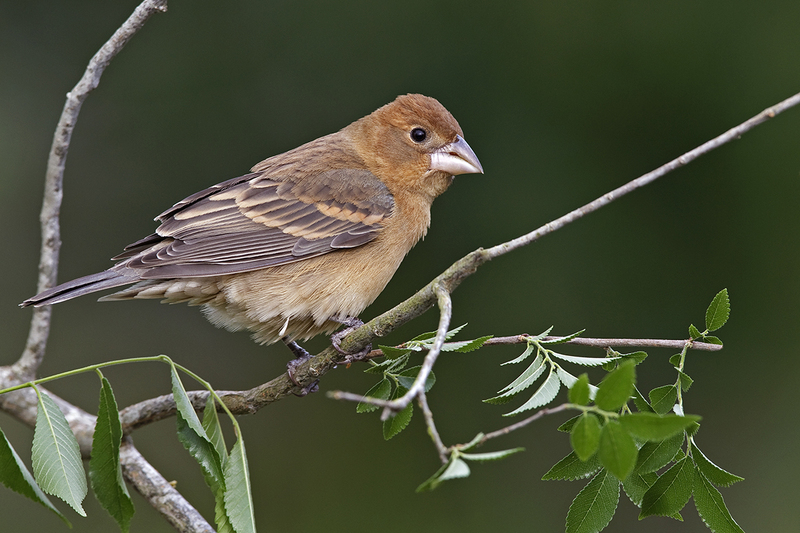 However, juvenile Blue Grosbeaks can show faint chest streaks, and streaks can be lacking on Indigo Buntings in worn plumage, so this is not a diagnostic point by itself. Size and shape. 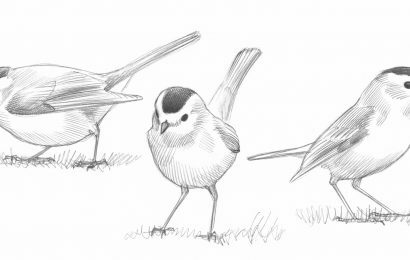 A medium-small but chunky songbird, with very large bill, large head, stout body, and wide, square-tipped tail. Wing bars. Two prominent wing bars; the upper one (tips of median coverts) is usually broader and more richly colored than the lower one (tips of greater coverts). Face pattern. Male has black feathering around the base of the bill. Female has very plain brown face, contrasting with pale base of thick lower mandible. Body plumage. Adult male blue all over, clouded with brown feather tips in fall. Young male wears a mix of brown and blue. Female is brown with blue tinges and has blurry stripes on the back but no streaking on the chest. The female Blue Grosbeak is a subtle bird, with only hints of blue on the shoulder, rump, and tail. 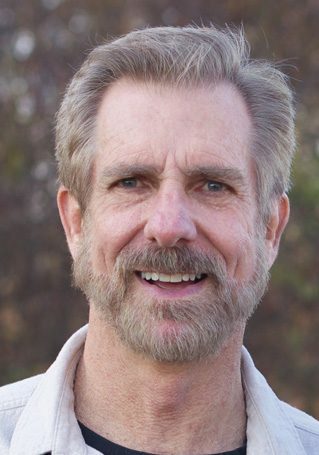 Overall body color varies from warm brown to dull gray-brown; the color is often richer on the head. The wing bars are always fairly conspicuous, varying from a dull buff-brown (as on the bird in this photo) to a brighter cinnamon-brown or chestnut-brown. Blurry streaking is sometimes visible on the back, while the chest is plain and unstreaked; the female Indigo Bunting has a plain back and finely streaked chest. Despite these subtle differences in markings, elements of shape are most important for ID. The grosbeak’s thick bill, big head, and chunky body are among its best field marks. Indigo Bunting, female. April in Galveston County, Texas. 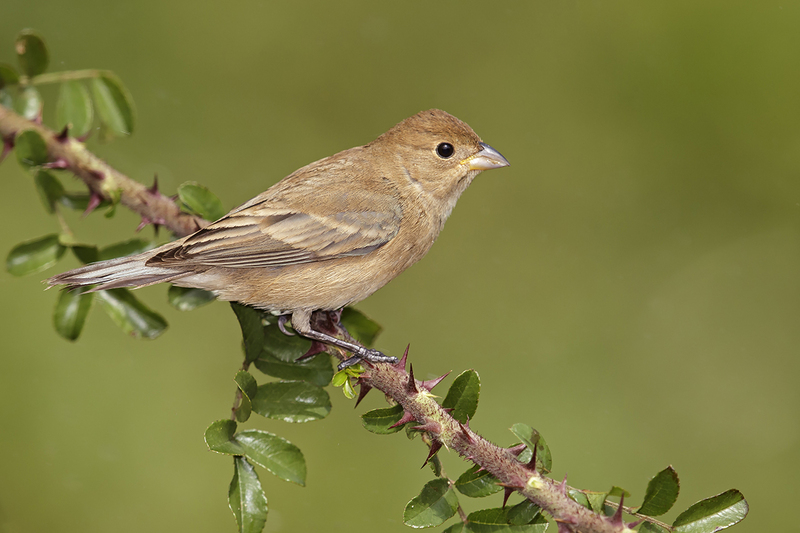 Few birds can match a female Indigo Bunting for being purely plain brown. None of our sparrows is so devoid of markings. That plainness, along with details of shape, can help to nail the ID. The bird does have wing bars, not obvious but always present except on some late-summer birds in very worn plumage. The wing bars can even look warm buff, bringing to mind the pattern of a female Blue Grosbeak. Usually, they’re barely different in color from the rest of the wing. Fine streaks on the chest are usually present but can be hard to see, as on this individual. And with a close look, a tinge of blue often shows on the tail, shoulders, and elsewhere. Blue Grosbeak, young male. April in Galveston County, Texas. One-year-old male Blue Grosbeaks in spring are quite variable, with almost any combination of blue and brown on the body plumage, but it’s very common for them to have the blue feathers concentrated on the head and chest. Their wing pattern is not always as striking as on the bird in this photo, but they always show warm chestnut-buff wing bars, with the upper one usually more deeply colored than the lower one. They usually show at least some black feathering around the base of the bill, lacking on Indigo Buntings. But some have only a little blue in the plumage and not much contrast in the wings, so a solid identification will rest on the bird’s distinctive shape. 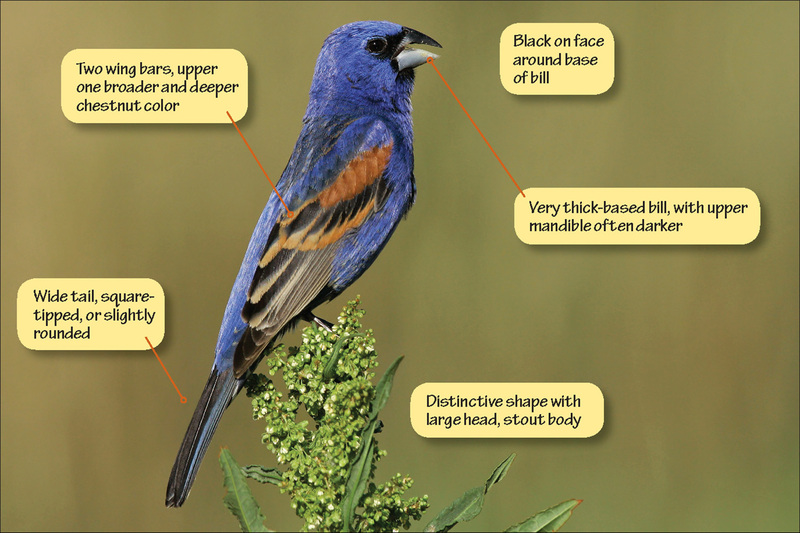 As with the Blue Grosbeak, one-year-old male Indigo Buntings are extremely variable in body plumage, from almost all brown to almost all blue. It’s common for them to show narrow, contrasting brown wing bars, but these shouldn’t be mistaken for the wider, more colorful wing bars of the grosbeak. In case of any doubt, the two species can be separated by their different shapes; the bunting never matches the grosbeak’s huge-billed, big-headed, thick-bodied silhouette. Among other minor points of shape differences, Blue Grosbeak often appears to have a wider tail than Indigo Bunting, but when the bunting spreads its tail (as the one in the photo is doing), this difference is obscured. Although I’ve watched Blue Grosbeaks in many places, my lasting impressions of them come from southeastern Arizona. They have a different timing there. Across most southern states, from the Gulf Coast to southern California, spring migrant Blue Grosbeaks can be expected in April. That’s true even in western Arizona. But in southeastern Arizona they can be hard to find in April, and they may not be present in full numbers until late May. Apparently, they don’t have to rush to grab the best territories. Although some start nest-building in May, their main breeding season in that region is late summer. In the southeastern Arizona lowlands, June is the hottest and driest month. Summer rains start in July, and by August the valleys are green again. 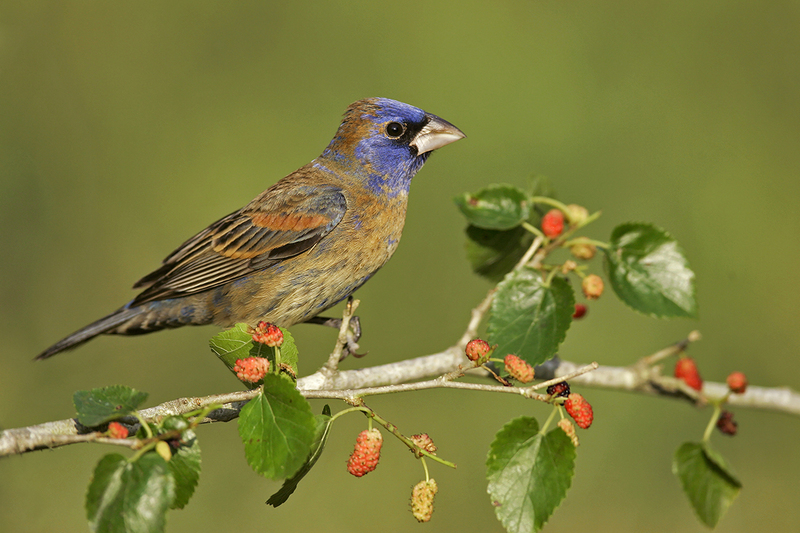 Blue Grosbeaks are actively raising young in this green season, and some pairs may not fledge young until September. These late-summer breeders may be early in one way: as morning singers. A few times I was out in prime habitat in southeastern Arizona, well before daylight in August, and found that these grosbeaks were among the first birds to sing. When a hint of light touched the eastern horizon, the rich, husky warbling of male Blue Grosbeaks came from far and near in the thickets. Eventually, other species chimed in. I’ve always wondered: Are Blue Grosbeaks elsewhere such early singers, or is that just an Arizona trait?